The World’s Most Famous Wrinkle Eraser! LifTight is the world-famous temporary skin tightener used by thousands of women to instantly look younger. It was clinically tested and found to reduce the appearance of lines, crow’s feet, creases and sags in just minutes…before your very eyes. It goes on under make-up and lasts 8 to 10 hours…all day or all night. Great for special occasions or use every day. 100% invisible – you may never look your age again. And you can start looking years younger the minute your LifTight arrives. Satisfaction is guaranteed – order today! Apply LifTight only to a clean, dry face. Hold area lightly for a count of three, let go and stay still for two to three minutes. You can see & feel the difference already, but wait ten minutes before using make-up. Train Your Skin: Use LifTight for just 1 hour the first day of use…for 2-3 hours the second day…3-4 hours the third day…4-6 hours the fourth day…then 8-10 hours thereafter. After washing LifTight off each evening, be sure to moisturize your face thoroughly. 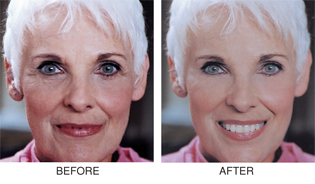 LifTight is a temporary wrinkle remover. To hydrate your skin each evening, use Dr. Feder’s Facial Therapy with antioxidant vitamins and Sodium PCA “moisture magnets” to nourish skin throughout the night while you sleep. For life-long, permanent wrinkle reduction, check out our Sta-Tight, the topical Botox®* alternative.